There are only a handful of the Abbey houses remaining, the are in the Long Lane (pictured below), and Athlunkard Street area. 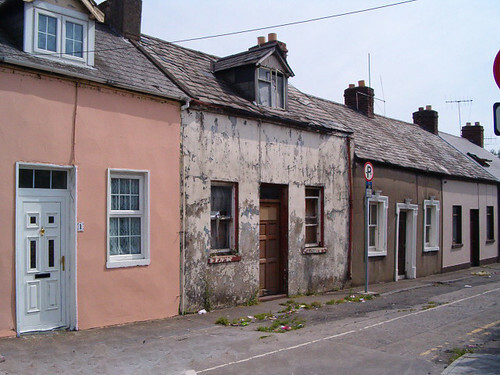 At one point in Limerick history this area would have been the most populous, sometimes with families of 10 or more sharing these small cottages. The other street names from the Abbey area were Sheep Street, Ahern’s Row, Gaol Lane Bow, Clancy Lane, Fish Street and Meat Market Lane. The 1907 “Sale of Limerick” Map for the area shows the extent of the streets and lanes, and how closely packed the houses were. In 1901 taking Sheep Street as an example the majority of the houses in this street only contained two rooms and two windows at the front making them 2nd class houses. While two of the houses in the street were considered 3rd class, one of these contained two rooms but no windows at the front. This was the home of John O’Mara, his wife Mary and their seven children with ages ranging from 18 years to 2 years. Many of these streets and lanes of the old Abbey were demolished to make way for a new road bypassing the city centre. Sheep Street was knocked entirely, though its name is kept alive in the form of an apartment complex. Others have been redeveloped, such as Sir Harry’s Mall, where the Absolute Hotel and Gaelcholáiste Luimnigh stand today. During this redevelopment excavations took place and the remains of a long since forgotten graveyard were found. The new bridge that forms part of the bypasses is named The Abbey Bridge, to commemorate the Abbey Fishermen who once made their homes in this area.